The closest I have ever been to death is a moment that I don’t even remember. Complications during childbirth are common. For me, at the (very) tender age of ten seconds old, there were two such complications: the umbilical cord and my size. The cord just so happened to wrap itself around my throat, cutting off oxygen to my body. As for my size, I was so huge (ten pounds, eight ounces) that I got stuck in the birthing canal. The doctors, desperate to save both my mom and me, made the decision to add a third complication: bone breakage. To get me out in the world, they snapped my collar bone, stopping death and granting life. They got the umbilical cord situation sorted out, too, but, by that point, I looked like a massive, blue mess. For me, bones technically mean everything. For Sakurako of Sakurako-san no Ashimoto ni wa Shitai ga Umatteiru, bones literally mean everything. As for the anime itself, well, it has a few broken bones of its own. Sakurako-san slates itself as a mystery anime. To this end, it decides on the episodic approach. The season consists of multiple mini-arcs with no arc lasting longer than two episodes. One arc involves a lost child. Another focuses on a lover’s decision. Another still deals with three previous best friends. Almost every episode has one trait in common: bones. Be it a skull found at the beach or some skeletal remains found at the foot of a hill, bones are often within reach. They make up the mystery part of the anime; they cause the audience to question how those bones came to be. “Question” is a bit lenient, however, because the audience never really gets to surmise or figure out the circumstances behind the bones. I.e., Sakurako does most of the work. This in turn makes the mystery part of the anime a moot point. Which is weird. If the mystery does not matter, then what is the point of the anime? The bones that Sakurako and Shoutarou find each tell a story. A story that, despite the bones being bleached with age or preserved in a box, still exists. Stories that are touching, emotional. They demonstrate what makes people human. Stories about a mother that loves her daughter and baby, the difficulty of moving on with one’s life, and relationships borne of mutual troubles. And as Sakurako further talks about, time does not stop. While the bones are fragments of the past, the present still has the people connected to those bones. Those people have memories. They have feelings. They have a connection that neither bones nor time can stifle come the future. So, in Sakurako-san’s vision, it’s best to live. To create those memories and share those feelings. In other words, death comes, but life comes first. Thematically, the anime does well. On a writing level, however, it gets shaky. 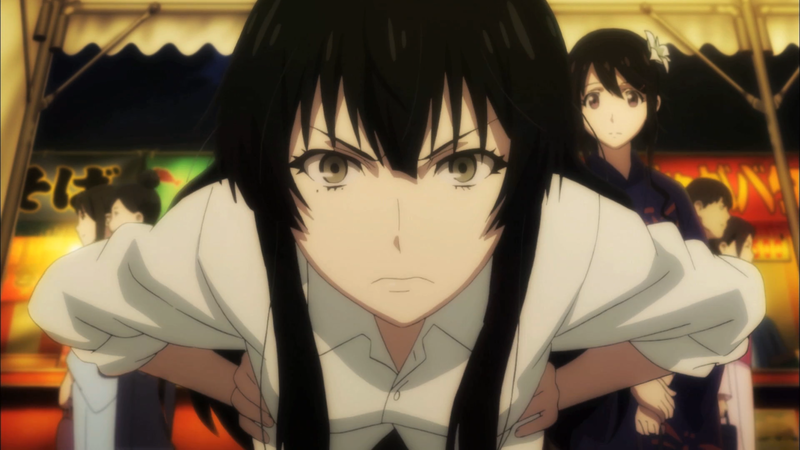 The episodic format does not entice the anime to have a prevalent, overarching narrative. An underlying thread exists in the form of Hanabusa, the mastermind behind many of the killings, but his name and his importance are very rarely referenced. Arguably, though, since he remains unimportant to the majority of the anime, his lack of presence is likewise unimportant. The episodic format also prevents the audience from properly resonating with the stories told. Quickly going from one person’s dilemma and tale to the next without letting the message sink in hampers the impact. Worse still, many of the messages are spilled out amidst the explanation of the mystery and, consequently, as large expository asides that are difficult to digest. Going back to the mysteries themselves, the presentation of each one also treads into repetitive territory. 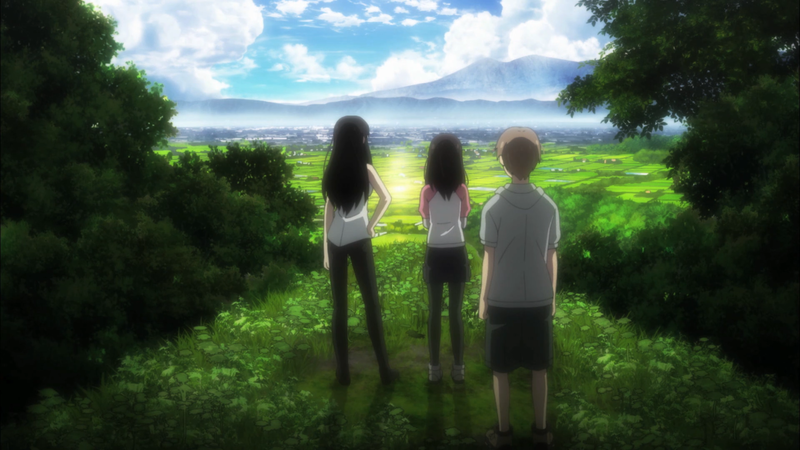 The boy and woman show up, find some bones, and, after finding a few clues, Sakurako solves the case. The argument that the repetition correlates to the repetitive nature of life and death comes off as more of an excuse rather than a purposeful decision. Overall, the narrative contains stories that, while not individually sound, collectively advocate the importance of life, the importance of death, and the messages that can be gleaned between them. One of Sakurako-san’s strongest facets is its art. While the cinematography is nothing special, consisting of standard shots, the backgrounds more than make up for any stagnancy in perspective. Various locations from dense forests to bustling festivals are visited. 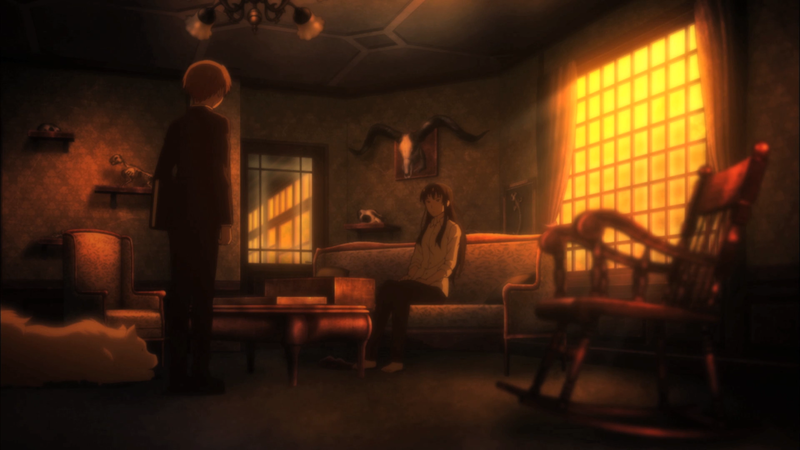 Sakurako’s study, the living room of the man with the weak heart, and Yumiko’s side room demonstrate the large amount of detail that goes into each location. And the lighting goes into overdrive, basking the different areas in sunlight, moonlight, and streetlamps. Sakurako’s specialized sequence, where a bountiful bunch of bones begin to walk about her as though they were alive, was a neat effect. Unfortunately, the anime rarely uses the sequence beyond the first quarter of the anime, making one wonder where it went and wanting to see more of it. Character designs are a small step down from the art. In general, they are quite plain, the characters lacking specific qualities that make their looks interesting. Shoutarou’s beige hair, the teacher’s suit, and the police officer’s work uniform are fitting but not exactly stunning. In fairness, the anime depicts realistic situations and people, so having realistic-looking characters makes sense. Sakurako’s design, however, deserves more attention. Her look is that of a classic beauty – long, dark hair, an ample figure, and an attractive face with striking eyes and a beauty spot for extra allure. Designing her as beautiful rather than ugly when Sakurako’s character revolves around death speaks volumes on how the anime views death. Her regular outfit also needs to be mentioned. She wears a white top with black pants, a famous dichotomy on the color spectrum. Here, it symbolizes the main theme of the anime: life and death. As for the actual animation, it remains relatively high. The laidback nature of the anime – no action-heavy scenes or the like – allows the cast to move with clarity. Hair and limb movements, as well as facial expressions and eye shifts, persist throughout the show, breathing life into an otherwise lifeless anime. Technically speaking, Sakurako-san has a lot of characters. But, technically speaking, the vast majority of them are largely unimportant. Their importance goes down due to the episodic format. Much of the cast has no presence between the different arcs – mostly because the people related to the bones are not the main or supporting characters. Of course, this statement is not true for every character. The cop takes part in some episodes. So does the teacher. And Yumiko, Shoutarou’s classmate, is literally a relative of the deceased in her story. But even these characters are not all that important. They exist as vehicles for the messages being told in their respective stories. To put it differently, they do not develop as characters per se, but they do allow the audience to understand the importance of the story being told. Similar to the narrative, then, who are the important characters of Sakurako-san? This question is a lot easier to answer compared to before: Shoutarou and Sakurako. Starting with Shoutarou, he is a high-school student who has recently taken some interest in bones. Said interest comes from his interest in Sakurako. While it is implied that he has feelings or, at the minimum, a crush on the beautiful lady, he began to hang out with her as a means to escape a life that he found boring. Over the course of the season, the audience comes to learn more about Shoutarou. He has training in martial arts. He seems to only think about food. He had a grandmother that cared deeply for him – more so than he ever knew. Shelving Shoutarou for the moment, Sakurako could not be more different than him. As an osteologist, her life’s work demands the study of bones. But it is more than just studying them: Sakurako loves bones more than she loves life itself. Thanks to her skeletal-spying, teeth-inspecting, and knowledge-having ways, she leads the charge in every mystery, revealing the truth of the bones before her. Like Shoutarou, more about her person is made known over the course of the season. She has a mean sweet tooth, especially when it comes to cakes and puddings. She has a fiancé whose sole purpose (since he is never actually shown) is to deter Shoutarou from pursuing his feelings (and angering the audience, too). Most important of all is her hatred of death, a byproduct of a traumatizing event from her past. Getting back to the technical speaking, Shoutarou and Sakurako do not develop as characters. At least, not to a substantial extent. Sakurako overcomes her fear of death by accepting Shoutarou, and Shoutarou overcomes the stagnant river of life by chasing after Sakurako. But these developments of theirs occur in the final episode. They are a culmination of the events, but a singular moment is not a large amount of change for the two. On an individual basis, their characters continue to prove how mishandled they are. For Shoutarou, the anime rarely shows how he came to find life so boring, what made him believe that his current course could be different. 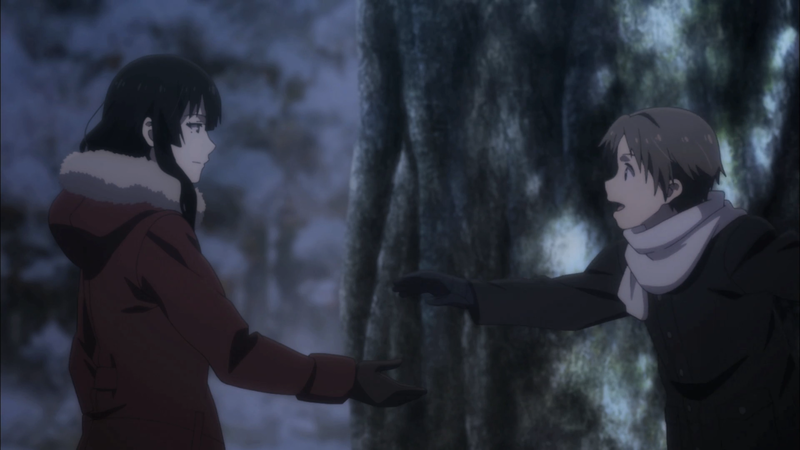 For Sakurako, that traumatizing event about her younger brother Soutarou never has a solid foundation. The event is barely referenced on occasion, but the actual moment is not shown. For an anime that emphasizes the past so much, it is surprising how little it cares about the pasts of its two main characters. Where Shoutarou and Sakurako shine best is on a group basis. From the discussions on their characters above, a certain pattern arises. Shoutarou is about life. He questions the life he leads. He regularly thinks positively about life. He loves life’s people, emotions, and opportunities. In contrast, Sakurako is about death. She fixates on death’s aftermath. She hates death itself. She defines herself as one truly traumatized by death. Shoutarou represents life. Sakurako represents death. Combined, they represent a beautiful and philosophical sentiment: life and death are inseparable. Just as Shoutarou chases after Sakurako, life (inevitably) chases after death. And just as Sakurako embraces Shoutarou, death (inevitably) embraces life. Shoutarou and Sakurako are a team in the same way that life and death (or death and life, depending on one’s outlook) happen to be. One could even argue how the faux romantic separation between Shoutarou and Sakurako symbolizes the separation between life and death – they are a coupling but two entities that can never realistically be together. A slight stretch, but it’s fun to think about. Regardless, Shoutarou and Sakurako mean a lot to each other even if they do not mean much on their own. And given that their shared theme of life and death is similarly shared with the narrative’s theme, they have more strength as characters than originally perceived. Easily the strongest part of the music is the ending track. Taking on more of a chilling tone, the vocalist accompanies a small number of instruments, letting her do most of the work. During the first half, the OP is nuanced and atmospheric. It’s not until the second half that the piece picks up, a more pronounced beat and lengthier lyrical sections taking shape. In a way, the ED mirrors the mystery cases Sakurako solves: They start off weird and unknown, and they end with a defined conclusion. 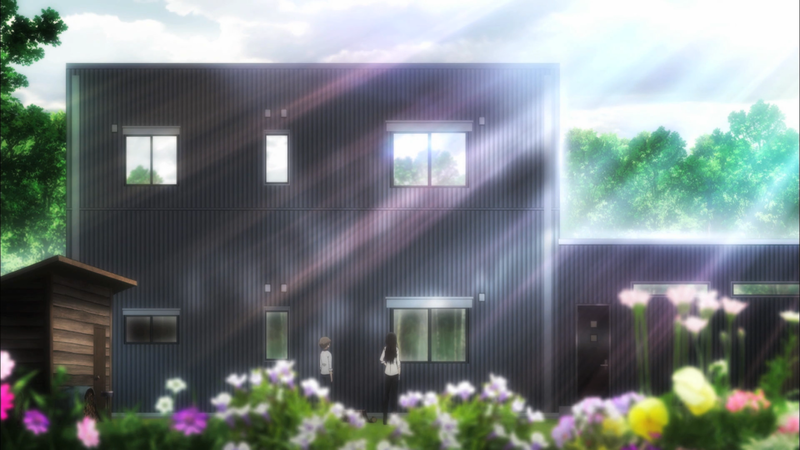 The whole track is ghostly, strange, and melancholic, standing as a wonderful addition to Sakurako-san. The opening track goes down a different route. Piano dominates much of the piece with a drum beat and some nice vocal work from the singer. Compared to the ED, the OP is happier, optimistic in tone. And this direction makes sense – having a happy OP and a sad ED matches the life and death motif that permeates the rest of the anime. The biggest problem with the OP, however, is the presentation. Where the ED sounds nuanced and foreboding, the OP sounds as though a lot of noises were mashed together. So while the piece has power in the context of the show, the piece lacks appeal outside of it. Then there is the rest of the original soundtrack. Sakurako’s investigative tracks, called (coincidentally enough) “Sakurako’s Investigation” and “An Answer to the Puzzle,” are the highlights. Their back-and-forth tune and triumphant composition work in tandem to form a track that follows the mystery-to-solved progress of the cases, much like the ED does. The large number of the tracks, however, are more atmospheric in nature. These tracks are usually one of two tones: slice-of-life like “Innocent Honesty” or sad like “Super Regret.” Sticking mostly to these two tones follows along with the consistent life-and-death motif that Sakrurako-san has been shown to use. These tracks are not particularly impressive, but they are fitting for the anime nonetheless. Voice-acting performances are neither amazing nor awful; they are okay for what had been provided. 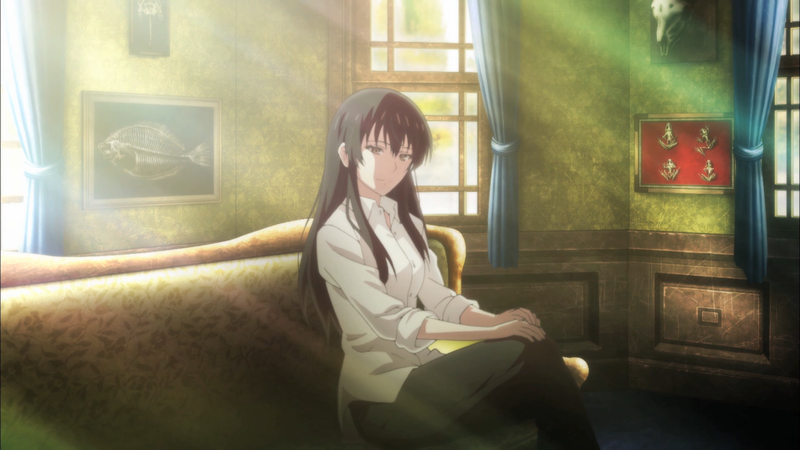 Shizuka Itou as Sakurako uses a mature and slightly arrogant voice that fits the beautiful woman. Junya Enoki, in one of his first major roles, as Shoutarou uses a younger voice for the so-called boy. And while Sakurako has moments of emotion – most often when she remembers Soutarou through Shoutarou – and Shoutarou can get stern with Sakurako, the scenes do not demand much out of the characters, so they never have the chance to shine. As a romance buff, it was certainly disappointing to see the anime refuse to pursue the romantic pairing between Shoutarou and Sakurako. That kind of relationship – an older woman being with a younger man – is rarely seen in anime, so when it seems like it should obviously exist and it doesn’t, the whole situation becomes infuriating. It also does not help that Sakurako seems to show zero romantic interest in Shoutarou, quelling those thoughts anyway. And combined with the anime not pursuing the other romantic pairing of Shoutarou and Yumiko, the lack of romance made me mad to see. Speaking of Sakurako, I cannot say that I liked her all that much. She’s certainly attractive in looks and she can be cute when she wants to, but, in personality, she was a turn-off. Very rude, very insensitive. The other characters are ones I did not care for much. Shoutarou is overly plain. The buddy cop seems like a nice dude, but, following the halfway mark of the season, he never shows up again. The teacher is similar. Yumiko, despite acting as the rebound romantic interest, is actually annoying. She is a fun character to have on screen – cute, confident, and caring – but she is a bit too much of a goody-two-shoes. My favorite tales from the season were Yumiko’s grandmother’s painting, Shoutarou’s grandmother’s pudding, and the mother protecting her children. I love my family to bits, so hearing about how much thought the grandmothers put into their respective actions for their grandchildren was something I understood from my own grandmother. As for that third tale, Ii-chan was a cute kid that made the gloomy anime slightly brighter. The other tales were fine but not really to my liking. It was a combination of the characters involved and the tales being told. The “cursed” man, the three best friends, and the cat and caretaker just didn’t have the same oomph as everything else. Sakurako-san no Ashimoto ni wa Shitai ga Umatteiru encounters both life and death. Some strong themes laced with mediocre writing. Some nice art and music filled with weaknesses. And some interesting tales while others not-so-much. The anime’s like a broken collar bone: technically worthwhile in some ways but literally problematic in others.